Twenty years of printing and change • Heart Printing & Graphics, Inc.
Hard to believe it’s been 20 years since I started Heart Printing. Back in 1996 I already had 13 years of experience selling printing and business forms. Going out on my own was a challenge but I knew the business well. Being technically minded, I learned how printing presses worked, what the different presses were and were not capable of printing and what press was best for a specific job. Then along came color copiers. Quality got better to the point where I sold Heart Printing and got a job selling copiers full-time. I thought the quality was so good that it could replace much of what was being printed on offset presses. I was right and color copiers just got better and better. Then things changed again. Along came Xerox and the Docutech and Docucolor copier lines and all of a sudden print shops were going digital. Unlike presses that needed printing plates, these digital presses could print just like a copier but at higher speeds and better quality. The market expanded and capabilities just continued to grow. So I opened Heart Printing again as an all digital print shop. With an array of digital equipment we were able to provide low cost, short run printing and compete in the marketplace. Today we use equipment from Xerox, H-P, Riso and still have access to traditional printing presses better suited for long run work. So whether you need 100 business cards or 10,000 posters, we can do it. The expansion into 3D printing came from a fascination with being able to manufacture prosthetic hands for kids right on my desktop. I’ve been a volunteer with e-NABLE (www.enablingthefuture.org) since 2013 and have printed and provided more than 50 hands to children in need. 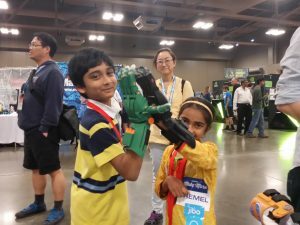 My latest print was a prosthetic arm for a local boy. High 5’s from a brother and sister at the SXSW e-NABLE booth. Hi, great history of your company.